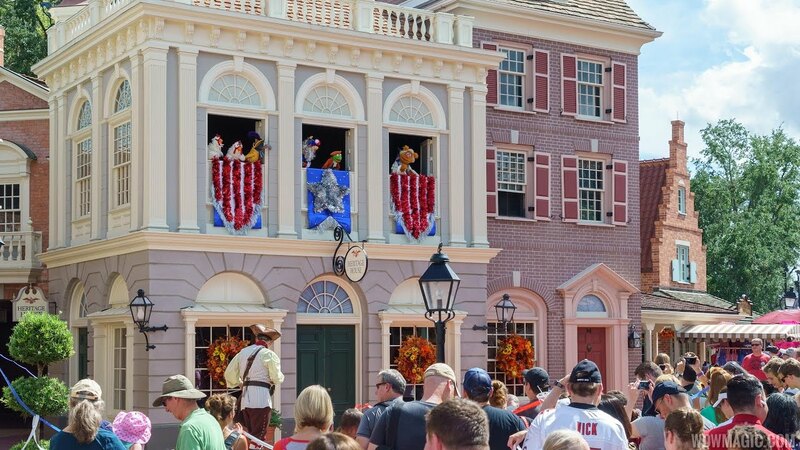 Oct 02, 2016 in "The Muppets Present… Great Moments in American History"
The Magic Kingdom debuted a new live show this morning in Liberty Square, featuring everyone's favorite Muppets. Taking place in the windows above the Hall of Presidents and Heritage House, "The Muppets Present… Great Moments in American History" brings the Muppets to life right before you unlike anything else at Walt Disney World. Hosted by James “J.J.” Jefferson, town crier of Liberty Square, and Sam Eagle, the new show takes place several times daily, just outside The Hall of Presidents. Also appearing is Kermit the Frog, Miss Piggy, Fozzie Bear and The Great Gonzo. Throughout the day, J.J. and the Muppets share their own unique take on the founding fathers as they recount the tale of the signing of the Declaration of Independence, complete with an original song and plenty of humor. At other times, you can catch the Muppets’ version of the midnight ride of Paul Revere. The show runs for around 10 minutes, and there is great viewing from anywhere around Hall of Presidents. There is no need to camp out for this one. More from "The Muppets Present… Great Moments in American History"